Part Two: we know that advertising works best when it’s part of a larger “system”, and you understand the metrics and tracking involved. Here, I’ll break down how to BUILD that system and how to measure your results. On the previous page, we talked about the wider CONTEXT of our advertising campaigns, and how they fit into a wider “system”. In this session, we’re going to look at some of the nuts and bolts of creating that system, and the key metrics (and tracking) you need to use. 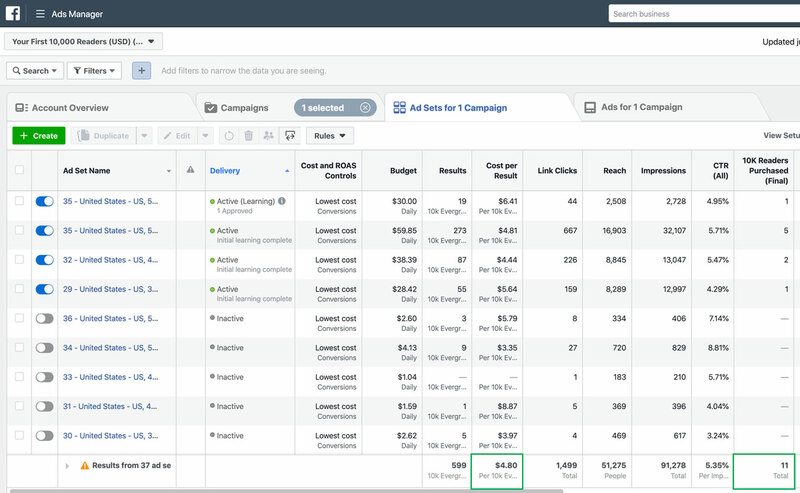 Your Facebook Ad Campaigns: creating the most effective ad campaigns, targeting the right people, :setting budgets. Scaling up: focusing on the ads getting you the best results and increasing your spend (without ruining your ROI). In this previous article, we went through the basics of getting a Facebook ad set up and running. But the “creating the ad” part is relatively easy (once you know what you’re looking at) – the real work starts when you’re considering your targeting options, copy, and budget. Tracking Pixel: this is a short snippet of code you will install on YOUR website, which will track a user’s actions after they view or click your ad. If you want to track email-list signups or sales direct from your website, the tracking pixel will let you do this. Most website providers make it pretty easy to install if you don’t want to go fiddling around with HTML coding – if you’re on WordPress, for example, there are a variety of free plugins you can install if your theme doesn’t support custom tracking code. A quick Google search will give you the instructions you need for your site if you get stuck. Unfortunately, when it comes to tracking sales via Amazon or the other stores, the tracking pixel won’t help – as we can’t install it on Amazon. So we’ll have to track sales from those platforms separately (more on this later). 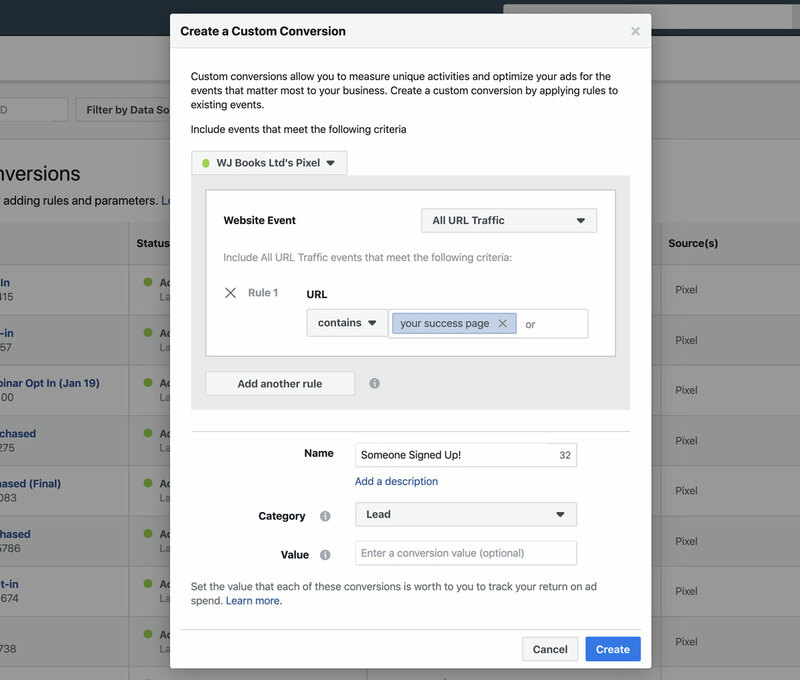 Custom Conversions: so, the tracking pixel is reporting on the actions users take after clicking your ad and visiting your webpage. But we need to TELL Facebook what these actions mean. This is where Custom Conversions come in – or, in other words, “telling Facebook what a successful action is”. A user visits your email-list “success” page after having signed up – this URL would represent one Custom Conversion (in this case, a “lead”). 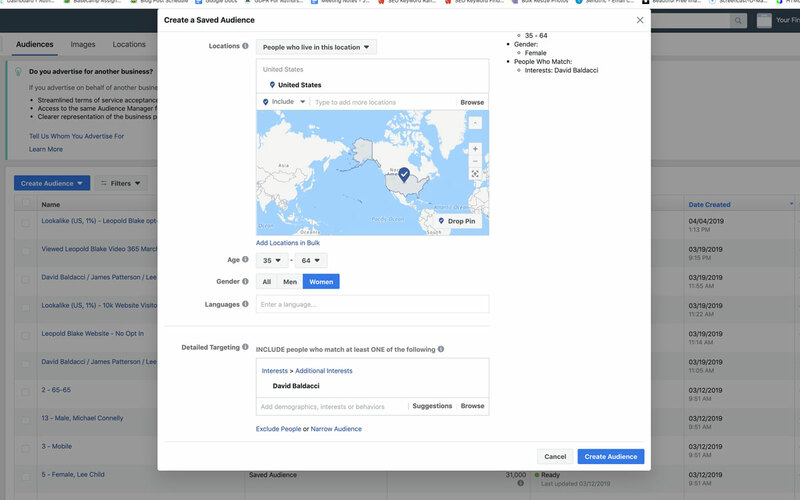 Just paste your “success page” URL into the box and you’re good to go – Facebook will track the number of people hitting this page and how many of them came from your ads (and which specific ad – so you can see what’s working). A user buys your book from Amazon and signs up to your email list via a separate opt-in form – eg a “special bonus”. This success-page URL would be both a “sale” and a “lead” (because only people who bought the book would be able to get to the webpage. Or, if you’re selling direct to your readers (via Shopify, GumTree, PayHip, or your own site) then – assuming you installed the tracking pixel on your checkout process – you could create a Custom Conversion to trigger whenever anyone hits your “thanks for buying” thank-you page (a “sale”). Again, just paste the URL in the box and Facebook will tell you which ads are driving the most actions. Those are just a few examples – you can set up Custom Conversions to be anything you like (filled in a form, viewed certain pages, bought something, visited a checkout page, etc). Audiences: or, in other words, “whom you’re sending ads to”. Generally speaking, a broad audience will be cheaper to reach, but will convert at a lower rate. A hyper-specific audience will be more expensive to reach, but will convert higher. Example: we set up a super-broad campaign (everyone in the USA) and were able to get clicks below $0.20. But that traffic only converted at around 1.5%. Or, in other words, it was costing us $13.20 per sale. Another campaign – more targeted this time – was getting $0.35 clicks. But that traffic was converting at 5% – costing us $7 per sale. Based on our pricing, KU page reads, and read-through, we know we’ll earn around $14 in LTV from each sale of book #1 (see previous article for LTV explanation), which makes our first ad roughly break-even, and a comfortable profit on the second ad. ^^ On the non-fiction side, each lead for this particular campaign cost us $4.80. But total sales of courses and other products totalled $7,469 – with an average order value of $679 from 11 sales. So each lead, on average, earned roughly $12 on just the initial sale (LTV is around $16 based on our tracking) on a spend of $4.80 – or a 150% – 230% ROI, depending on which earnings figure you want to use. 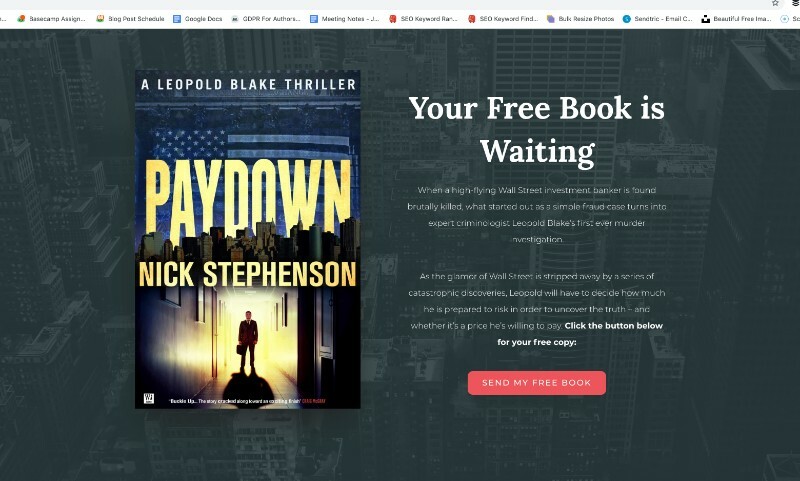 Retargeting: you can send ads to people who have visited your book pages on your site, those who didn’t sign up to your email list, those who clicked to view specific books but not others – you can get as granular as you like. Lookalike audiences: Facebook can extrapolate common behaviours and interests from your website-visitor audiences and find similar people in different countries who are likely to convert for you. This is a great way of finding “more of the same” when you discover an audience that’s working really well for you. 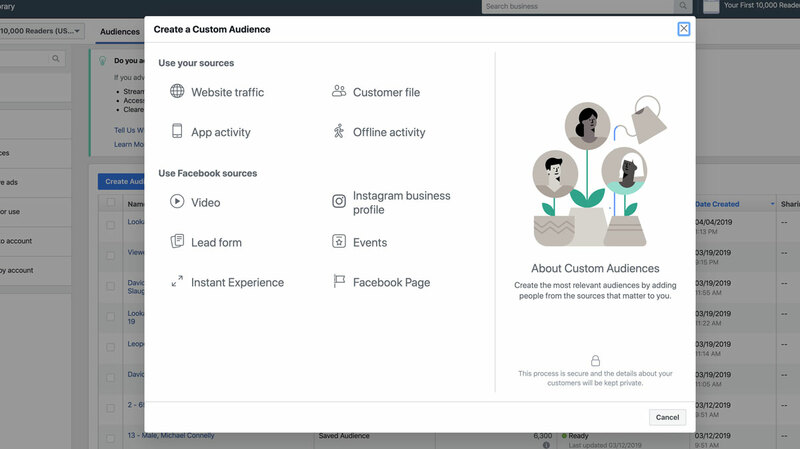 Custom Audiences: in addition to website visitors (above) you can also create target audiences of people already on your email list (by uploading their details), people who have filled in Lead Forms, people who have watched your videos, or people who have engaged with you on Facebook in some way in the past. All these people have interacted with you before, and are considered “warm” audiences (they usually convert better). You can also specific marital status, devices used, behaviours, and a range of other targeting options you can test. These “saved audiences” can be saved for use in the future, and you can combine them with other targeting options (more on that in a moment). Making sure you have a continually fresh source of target audiences is key for scaling up your results. Oftentimes, authors get GREAT results with one particular demographic, but quickly exhaust the audience – and then don’t know where to go next. And so on. The combinations are pretty exhaustive – and you can go as granular as you like. 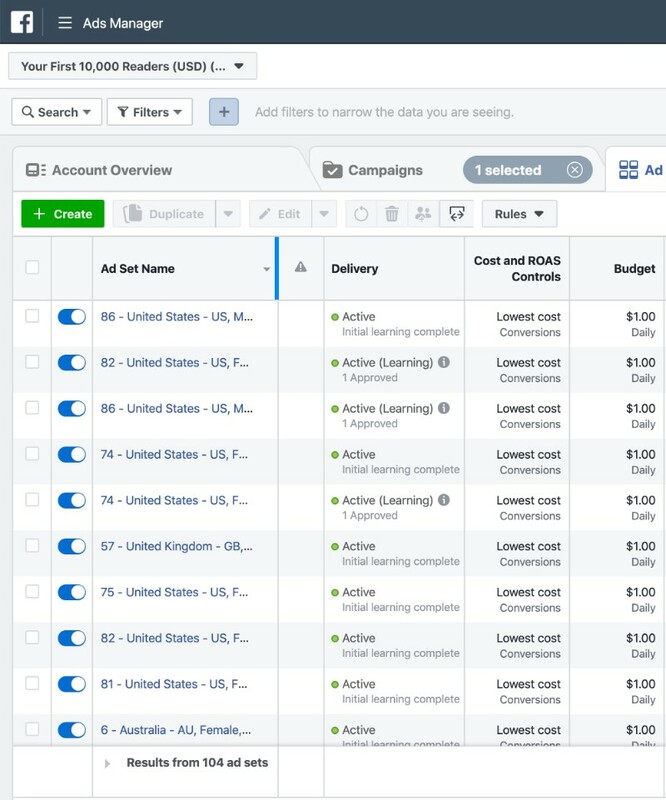 Campaign Level: here, you’ll set the objective (usually “traffic”, “conversions”, or “lead generation”) and you have the option to use Facebooks Campaign Budget Optimization (CBO) – which will automatically distribute your daily budget among your different ad-sets based on how many people they reach and how well they are expected to perform. 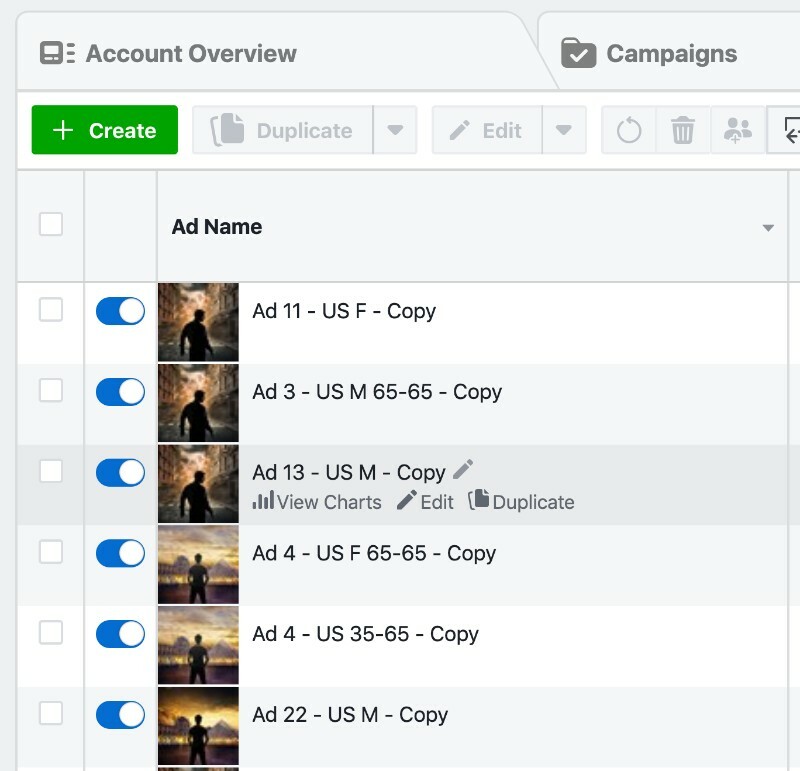 From September 2019 this is activated by default – although you can set manual levels for each ad-set. So, if you want to spend $10 a day, CBO can distribute that in a manner it considers best to reach your objectives – one reason why running multiple ad-sets is a good idea (see below). Ad-Set Level: the “ad-set” is basically the targeting / audience options you configure. 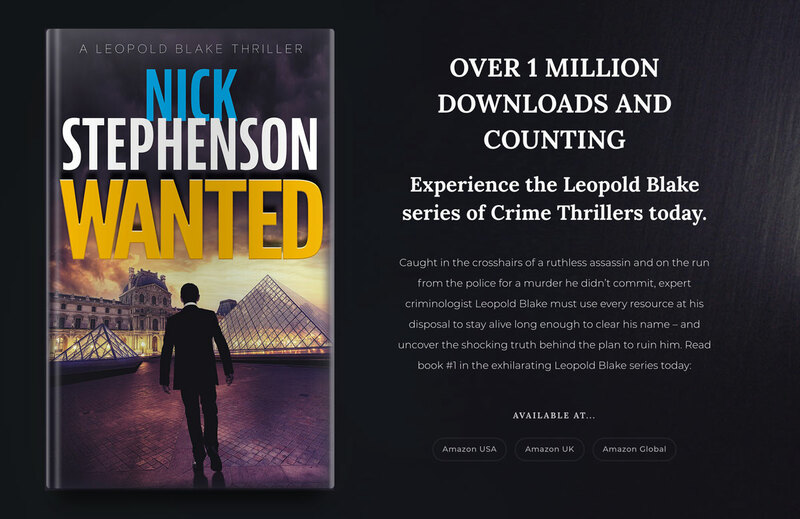 A lot of authors will try a single ad-set target (women, aged 35-64, in the US, who like David Baldacci, for example) but I always recommend using as many ad-sets as you can stomach, especially in the beginning when you’re trying to figure out what works. For example, instead of targeting “women, aged 35-64, USA, David Baldacci” I can split that into narrower age groups, add in males, and add in negative targeting (likes David Baldacci but does NOT like Karin Slaughter, for example). That can easily boost the number of adsets from one to dozens. Then your $10 daily budget is still split – so you spend the same – but you can easily compare options side by side. 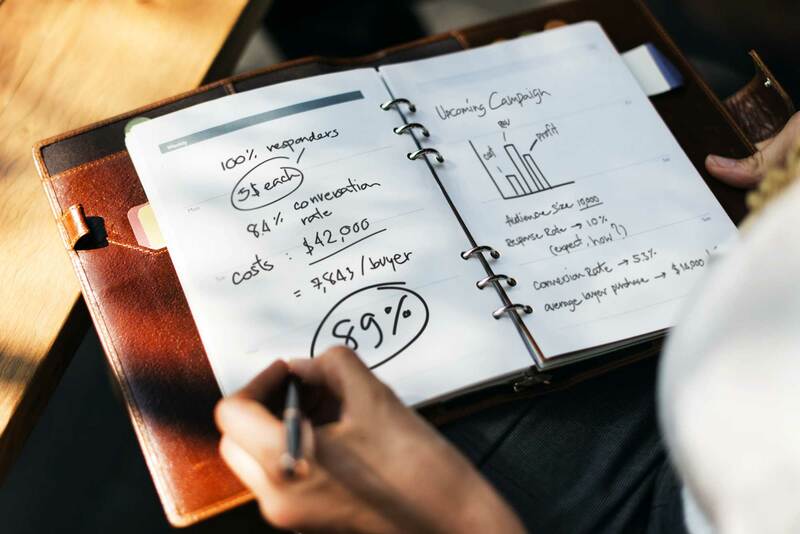 (NB – the minimum spend per ad-set is either $1 for “traffic” and “conversions” or $5 for “engagement” – so depending on your daily budget and objectives, this may affect the total number of ad-sets you can run. Eg – if you only want to spend $10 per day, you’ll only be able to run ten ad-sets maximum). Approaching the ad-set level in this way means I can see exactly which demographics are performing the best – and I can turn off the poor performers easily, without affecting the results from the “good” ones. When we get to “scaling up” having those multiple ad-sets will make life MUCH easier too (you can scale up the good ones). The ad level: This is basically the “stuff users see” when your ad is displayed – and includes the image / video, text copy, and links you want to use. Then, again, you can turn off the bad ones and focus on the best performing creatives. We’ll cover how to do that when we get to “scaling up”. Creating a compelling, well-targeted ad is only half the puzzle – you’ll also need to think about WHERE you’re sending people, and how that destination is optimised to get you the results you want. Headline: have you “hooked” your visitor in with a compelling offer? Image: chances are you’re offering a book – is the cover image professional and genre appropriate? Copy: have you clearly (and concisely) explained what people need to do and what to expect? In the example above, users click through to my email signup page. 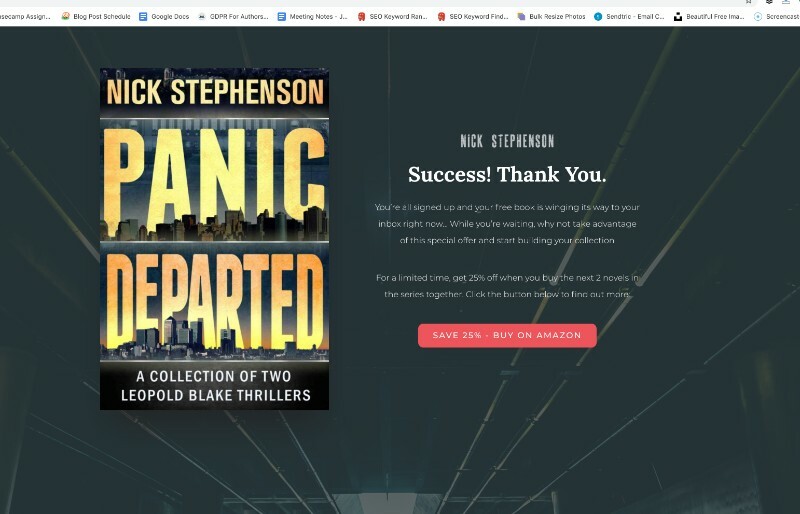 After clicking the button, they enter their email address and are forwarded to a “success” page (where I also offer them one of my boxed sets). The entire process is completely automated, tracked by Facebook, and generally converts in the ~50% range (out of 100 clicks I’ll get around 50 new leads). I’ve seen plenty of cluttered or badly designed signup pages converting at ~20% to know fixing your webpage is one of the quickest and simplest ways to double your ROI (or more). Building an email list is only worthwhile if you’re DOING something with all those email addresses. Remember, these are pre-qualified people who have expressed an interest in your work and know who you are (which puts them ahead of “cold” traffic by a fair margin). We’ve talked before about the “click is king” (or queen) and where you might be paying $0.50 per click from advertising, your email clicks are – more or less – free. Or, at least, you’re not being charged for them. 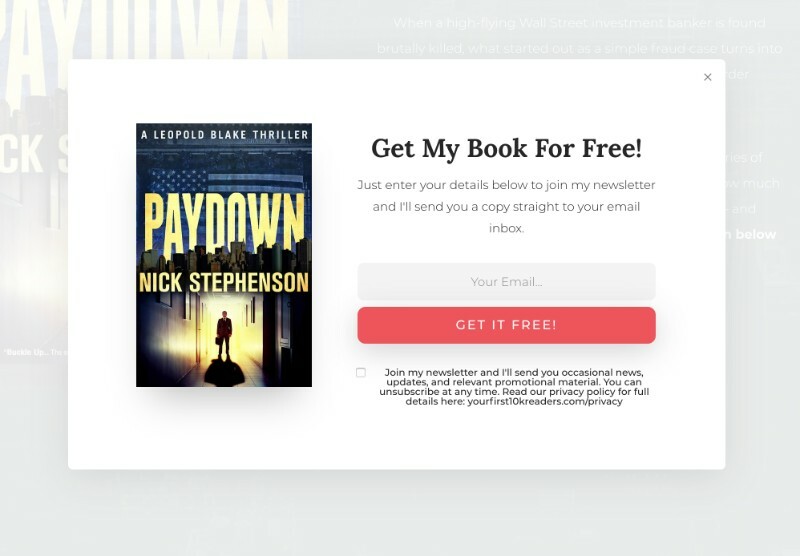 So it makes sense to capitalise on this and introduce your email subscribers to your other books – when the time is right. With your Facebook pixel installed and your Custom Conversions configured (see above) it’s pretty easy to measure your results on your OWN website. But what about your sales via Amazon? This is where things get more complicated… we can’t install a pixel on Amazon (or the other stores) so we have NO IDEA which clicks are converting into sales. 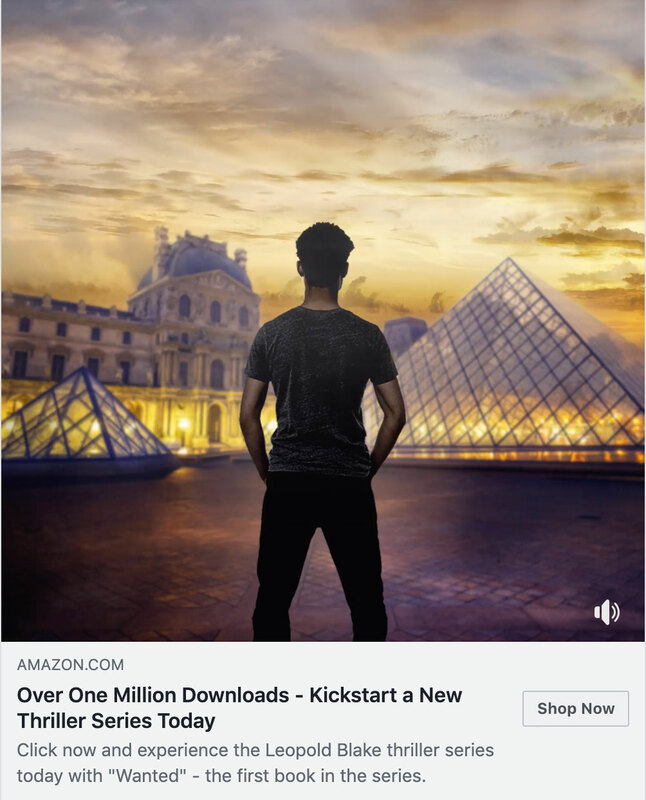 The Amazon Associates affiliate program allows you to configure tracking links for all products on Amazon – and will tell you (a) how many clicks you sent, and (b) how many sales you got from those clicks. There is a separate Associates program for each store (.com, .co.uk, .com.au, etc) so you can sign up for an account in each territory in which you plan to use paid advertising. Put the links on your website, send traffic there. Instead of putting your tracking link directly into your advertising (or emails) you can instead link to a landing page on your own website which contains the tracking links. This is totally within the Associates terms – and is pretty standard. 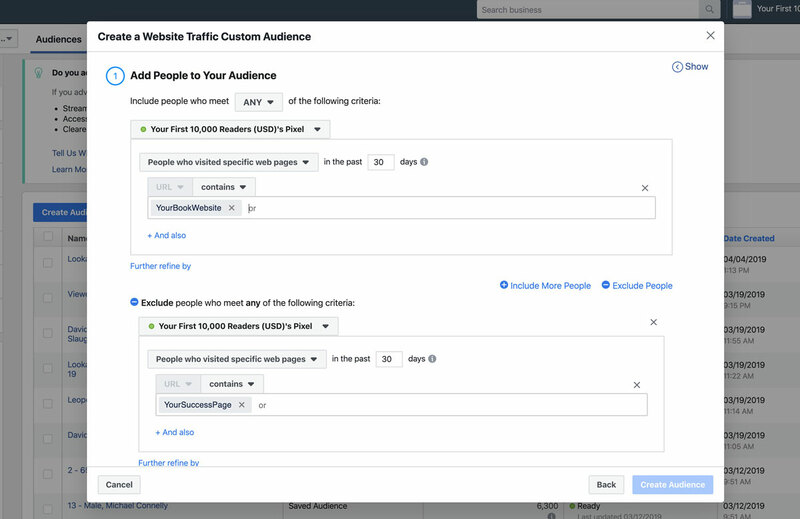 However, the extra click people need will cause some of your traffic to drop off – but you’ll still be able to see the total clicks to Amazon versus the total clicks from your ads to measure just how much drop-off there is. The route you go is 100% up to you. Many authors use the first option, happy to risk the consequences in exchange for getting reliable data. Other authors prefer to go the “safe” route and install a landing page with tracking links, then send traffic there. Whichever route you go, Amazon Associates will give you the ability to create unique “custom tracking IDs” so you can see exactly which ads are converting the best – so you can see where to focus your efforts, and quickly identify any issues with your book pages (eg – lower than expected conversion rates) that might need addressing. In short, Facebook (and Amazon Associates) give you all the data and tools you need to determine what’s working and what’s not working. How we USE that data and those tools to then optimise (and scale up) our efforts is the next piece of the puzzle.